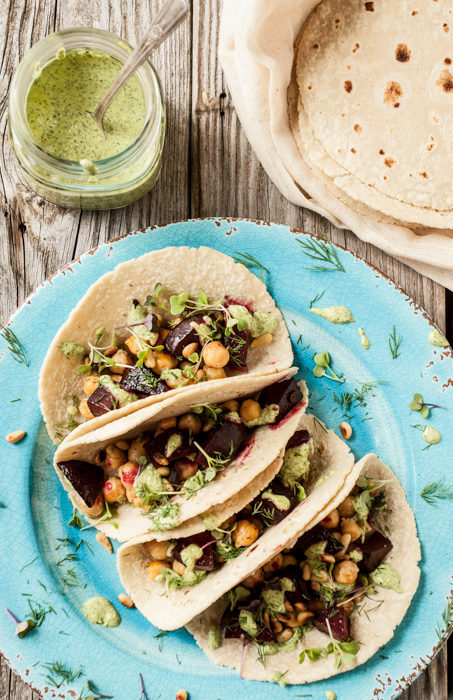 These beet tacos were the recipe of the week for our CSA members and they’ve been a huge hit in our household all week. I’ve whipped them up twice now and absolutely love the flavor combination of the beets, fresh herbs and tangy sauce. These are a great main course that highlight some of the best summer bounty. Beet season is a very special time of the year on our farm and we love celebrating the magnificent beet by preparing simple meals like this. Besides, who doesn’t love a good taco recipe that can be whipped up in no time on a busy weeknight? I hope all of you beet lovers enjoy these tacos as much as Taylor and I do. They pair especially well with a simple homemade margarita and a few corn chips on the side. Go wild! Cheers from Tumbleweed. Preheat the oven to 400F. Toss the chopped beets with 1 1/2 tablespoons olive oil and sprinkle with a little salt and pepper. Place on a baking sheet and cover the baking sheet with foil. Place in the oven and roast until tender. About 15 minutes. Rotate the pan halfway through cooking. Beets are done when they are can be easily pierced with a fork. Heat a dry skillet over medium-high. Place the pine nuts in the skillet and toast until lightly browned on all sides. About 2-3 minutes. Shake the pan often and don't walk away! Burnt pine nuts are expensive! Prepare the sauce by combining all the ingredients and whisking until smooth and creamy. This works best with an immersion blender or small food processor. Taste test and adjust seasonings as needed. *Use this recipe as a guide *Adjust measurements and ingredients as necessary. *Taste test as you go. *Cooking times will vary depending on your oven and specific ingredients. *Have fun in the kitchen. Oh this is going to be perfect for dinner next week!! YAY!!! These look delicious. I love the CSA program, fresh vegetables and help or the community as well! Your photos are great and I’m glad you could make something great out of the local produce! Made these for dinner but with pita instead of tacos. Very tasty – flavours went really well together. Thanks for a great recipe to help make the most of our CSA beets! I’m happy you loved this dish too! Happy CSA cooking!! !